CT7 Price Gun Labels There are 58 products. This listing is for a pack of 10,000 White Peelable CT7 26mm x 16mm price gun labels (10 rolls). The labels are White with a peelable adhesive and have square edges. They will fit all guns that take a 26mm x 16mm label including Puma, Lynx and Dataply etc. 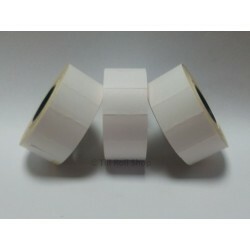 This listing is for a pack of 36,000 White Peelable CT12 26mm x 16mm price gun labels (30 rolls). The labels are White with a peelable adhesive and have square edges. They will fit all guns that take a 26mm x 16mm label including Puma, Lynx and Dataply etc. This listing is for a pack of 10,000 White Permanent CT7 26mm x 16mm price gun labels (10 rolls). The labels are White with a permanent adhesive and have square edges. They will fit all guns that take a 26mm x 16mm label including Puma, Lynx and Dataply etc. This listing is for a pack of 30,000 White Permanent CT7 26mm x 16mm price gun labels (30 rolls). The labels are White with a permanent adhesive and have square edges. They will fit all guns that take a 26mm x 16mm label including Puma, Lynx and Dataply etc. This listing is for a pack of 10,000 White Freezer CT7 26mm x 16mm price gun labels (10 rolls). The labels are White with a freezer adhesive and have square edges. They will fit all guns that take a 26mm x 16mm label including Puma, Lynx and Dataply etc. This listing is for a pack of 30,000 White Freezer CT7 26mm x 16mm price gun labels (30 rolls). The labels are White with a freezer adhesive and have square edges. They will fit all guns that take a 26mm x 16mm label including Puma, Lynx and Dataply etc. 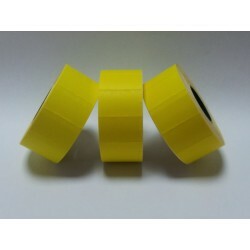 This listing is for a pack of 30,000 Yellow Peelable CT7 26mm x 16mm price gun labels (30 rolls). The labels are Yellow with a peelable adhesive and have square edges. They will fit all guns that take a 26mm x 16mm label including Puma, Lynx and Dataply etc. This listing is for a pack of 10,000 Yellow Peelable CT7 26mm x 16mm price gun labels (10 rolls). The labels are Yellow with a peelable adhesive and have square edges. They will fit all guns that take a 26mm x 16mm label including Puma, Lynx and Dataply etc. This listing is for a pack of 10,000 Yellow Permanent CT7 26mm x 16mm price gun labels (10 rolls). The labels are Yellow with a permanent adhesive and have square edges. They will fit all guns that take a 26mm x 16mm label including Puma, Lynx and Dataply etc. This listing is for a pack of 30,000 Yellow Permanent CT7 26mm x 16mm price gun labels (30 rolls). The labels are Yellow with a permanent adhesive and have square edges. They will fit all guns that take a 26mm x 16mm label including Puma, Lynx and Dataply etc. This listing is for a pack of 10,000 Yellow Freezer CT7 26mm x 16mm price gun labels (10 rolls). The labels are Yellow with a freezer adhesive and have square edges. They will fit all guns that take a 26mm x 16mm label including Puma, Lynx and Dataply etc. This listing is for a pack of 30,000 Yellow Freezer CT7 26mm x 16mm price gun labels (30 rolls). The labels are Yellow with a freezer adhesive and have square edges. They will fit all guns that take a 26mm x 16mm label including Puma, Lynx and Dataply etc.